Julia Ann "Julie" Harris (December 2, 1925 – August 24, 2013) was an American stage, screen, and television actress. A 10-time Tony Award nominee and five-time winner, she won for I Am a Camera (1952), The Lark (1956), Forty Carats (1969), The Last of Mrs. Lincoln (1973), and The Belle of Amherst (1977). She also won three Emmy Awards, a Grammy Award, and was nominated for the Academy Award for Best Actress for the 1952 film The Member of the Wedding. She was inducted into the American Theatre Hall of Fame in 1979, received the National Medal of Arts in 1994, and the 2002 Special Lifetime Achievement Tony Award. Julia Ann Harris was born in Grosse Pointe, Michigan, the daughter of Elsie L. (née Smith), a nurse, and William Pickett Harris, an investment banker. She graduated from Grosse Pointe Country Day School, which later merged with two others to form the University Liggett School. In New York City, she attended The Hewitt School. As a teenager, she also trained at the Perry-Mansfield Performing Arts School & Camp in Colorado with Charlotte Perry, a mentor who encouraged Harris to apply to the Yale School of Drama, which she soon attended for a year. Along with Chita Rivera, Harris holds the record for the most individual Tony Award nominations, with 10 nominations. She held the record for most competitive Tony wins (five) until Angela Lansbury tied her in 2009. Audra McDonald has since passed them both, with six acting Tony Award wins. In 1966, Harris won the Sarah Siddons Award for her work in Chicago theatre. Harris's screen debut was in 1952, repeating her Broadway success as the monumentally lonely teenaged girl Frankie in Carson McCullers' The Member of the Wedding, for which she was nominated for the Academy Award for Best Actress. Harris played the ethereal Eleanor Lance in The Haunting (1963), director Robert Wise's screen adaptation of a novel by Shirley Jackson, a classic film of the horror genre. Another cast member recalled Harris maintaining a social distance from the other actors while not on set, later explaining that she had done so as a method of emphasizing the alienation from the other characters experienced by her character in the film. She reprised her Tony-winning role as Mary Todd Lincoln in The Last of Mrs. Lincoln (1973) in the film version (1976). Another noteworthy film appearance was the World War II drama The Hiding Place (1975). She also appeared in such films as East of Eden (also 1955), with James Dean (with whom she became close friends), Requiem for a Heavyweight (1962), with Paul Newman in the private-detective film Harper (1966), and Reflections in a Golden Eye (1967). For her television work, Harris had won three Emmy Awards and had been nominated 11 times. One of her most famous television roles was as Queen Victoria, in the 1961 Hallmark Hall of Fame production of Laurence Housman's Victoria Regina, for which she won an Emmy. Earlier, also for the Hallmark Hall of Fame, she starred as Nora Helmer opposite Christopher Plummer in A Doll's House (1959), a 90-minute television adaptation of Ibsen's play. She made more appearances in leading roles on the Hallmark program than any other actress, also appearing in two different adaptations of the play Little Moon of Alban. In her later career, she was perhaps best known as country singer Lilimae Clements, the eccentric and protective mother of Valene Ewing (played by Joan Van Ark) on the CBS nighttime soap opera Knots Landing. The role was as a guest appearance in 1980 before returning as a series regular from 1981–87. Harris lived in West Chatham, Cape Cod for many years until her death. Thrice divorced, she had one son, Peter Gurian. A breast cancer survivor, she suffered a severe fall requiring surgery, a stroke in 2001, and a second stroke in 2010. Harris died on August 24, 2013, of congestive heart failure at her home in West Chatham, Massachusetts, aged 87. She was survived by her son, Peter Gurian. Ben Brantley, theater critic for The New York Times, considered her "the actress who towered most luminously ... rather like a Statue of Liberty for Broadway." Alec Baldwin, with whom she appeared in Knots Landing, praised her in a tribute in the Huffington Post. "Her voice was like rainfall. Her eyes connected directly to and channeled the depths of her powerful and tender heart. Her talent, a gift from God." 1 2 Kennedy, Mark (August 24, 2013). "Julie Harris, Broadway Star, Dies at 87". Associated Press. Retrieved August 25, 2013. 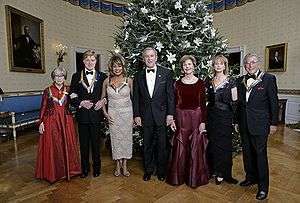 ↑ "Lifetime Honors – National Medal of Arts". National Endowment for the Arts. Retrieved December 15, 2012. 1 2 "Tony Awards Facts & Trivia". Tony Awards. Retrieved August 25, 2013. ↑ "Julie Harris profile at". FilmReference.com. Retrieved November 15, 2012. 1 2 Mula, Rose Madeline. "Julie Harris – Too Good to be True?". Senior Women Web. Retrieved November 15, 2012. ↑ Weber, Bruce (August 24, 2013). 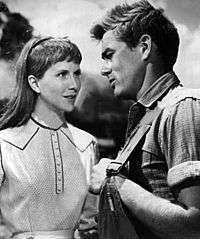 "Julie Harris, Celebrated Actress of Range and Intensity, Dies at 87". The New York Times. Retrieved August 25, 2013. ↑ "William Luce's Bronte – Press". Samuel French, Inc. Retrieved August 25, 2013. ↑ "The Haunting (1963)". Internet Movie Database. Retrieved November 15, 2012. ↑ Paller, Rebecca (January 16, 2009). "Julie Harris... A Bit of Magic on a Cold Winter's Day". Paley Center for Media. Retrieved November 15, 2012. 1 2 Weil, Martin (August 24, 2013). "Tony-Winning Actress Julie Harris Dies at 87". The Washington Post. Retrieved August 25, 2013. ↑ "WHAT Board". Wellfleet Harbor Actors Theater. Retrieved November 15, 2012. ↑ Rizzo, Frank (August 28, 2008). "Julie Harris Returns To Stage". Hartford Courant. Retrieved November 15, 2012. ↑ Rose, Judy (November 4, 2012). "Michigan House Envy: Windmill Pointe palace offers medieval charm". Detroit Free Press. Retrieved November 15, 2012. ↑ Jon Caswell (July–August 2007). "The Belle of Aphasia". Stroke Connection. nxtbook.com. Retrieved November 15, 2012. ↑ Brantley, Ben (August 25, 2013). "Luminous Julie Harris, Close Up and Afar". The New York Times. Retrieved August 30, 2013. ↑ Baldwin, Alec (August 30, 2013). "A Public Farewell to Julie Harris". Huffington Post. Retrieved August 30, 2013. ↑ Snetiker, Marc (August 27, 2013). "Broadway Theaters to Dim Lights in Honor of Stage Legend Julie Harris". Broadway.com. Retrieved August 30, 2013. Julie Harris Documentary and Narration Work. James Whitmore - Give 'em Hell, Harry!